This house was one of the four houses built by the Thornbury builder, George Hodges around 1870. George named the houses ‘Victoria Terrace’. As far as we know the first occupants of the house were John and Jane Drake. John and Jane Drake – the 1876 Rate Book tells us that John Drake was the occupant of the house and that by 1880 Rate Book Jane Drake was the tenant. Jane’s maiden name was Heard and she was born in Hartland in Devon about 1821. There are a few Heard families in Hartland at this time and we have not established who her parents were, as by 1841 she was a servant in Parkham, not far from Hartland. By 1851 she had moved further away from home – she is shown as an unmarried servant aged 34 working for Henry Britton, an attorney at his home in Chudleigh House, Clifton. She married a widowed master sawyer from Thornbury, John Liddiatt in Bristol in June quarter 1854 who had been living in Horseshoe Lane in 1851. In 1861 Jane and John were living in Rotten Row (now called Chapel Street) in the Wheatsheaf beerhouse. John Liddiatt was a sawyer aged 56. Jane was aged 40. John appears to have died. Jane Liddiatt re-married in Bristol in December quarter 1869, to another widower, John Drake. In 1871 she was living in 25 Victoria Street, Bristol with John Drake, a shoemaker, aged 53 from Crediton in Devon. Jane’s age was given as 50. John’s first wife, Elizabeth, had died earlier in the year aged 49.
whose death was registered in Clifton in 1895 aged 79 – her age seemed to vary a lot in previous censuses! The Hemming family – in the 1887 Rate Book and the 1891 census the house was occupied by John William Hemming. He was a police constable aged 34 from Stroud and his wife, Elizabeth Ellen aged 34 from Challon, Berks. Also living there were two lodgers including Frank Yeomans a railway porter aged 18 from Studley in Warwickshire and Edgar Marsh a bird taxidermist aged 76 who had been born in Thornbury. John’s occupation obviously kept the family on the move. Earlier, in 1881, John had been an unmarried police constable in Cirencester. They lived for a time after their marriage in Iron Acton where their first child, Albert William was born about 1884. Percy, their second son, was born in Thornbury about 1888. 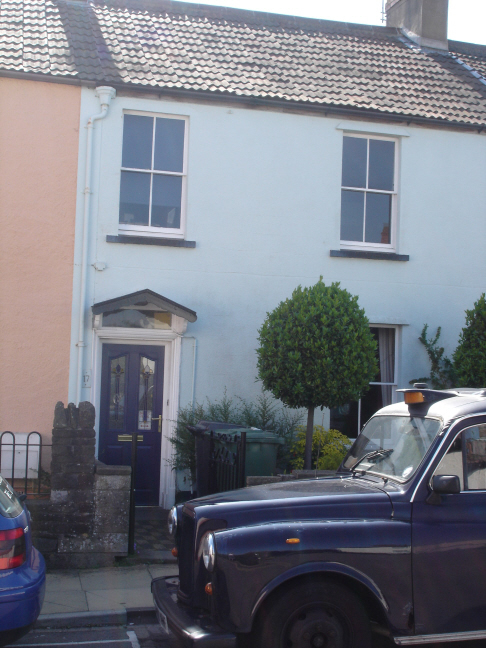 Later they seemed to leave Thornbury to move to Fishponds where two more children, Violet H and Elsie M were born in 1892 and early 1901. At the time of the 1901 census, the family were living at 6 Filwood Road, Bristol. Their son, Albert had become a tram car conductor. George and Edna Ord – shown as living in the house from about 1935 onwards. George was born in the Sunderland area on 13th February 1907, the son of William Ord, a miner of Ryhope, Sunderland. He moved south to Thornbury and on 24th May 1934 he married Edna Frances Thompson, the daughter of Albert Ernest Thompson, the baker. Edna was born on 5th May 1909. ‘Her birth was registered in Chipping Sodbury area. At the time of his marriage, George was a carpenter. We understand that he later worked for Hortham Hospital as a charge nurse. George was a keen cricketer playing for Thornbury Cricket Club and he also played football. The photos on the right show Edna before she married and George when he was playing in 1936. George died on 19th June 1980 aged 73 years. Edna died in Chipping Sodbury on 17th November 1993 aged 84 years. One of the photographs above shows the Ord/Thompson wedding group. The other photograph shows the three Thompson bridesmaids, Betty, Eileen and little Jean.